What qualifications are there for a PERM Labor Certifications? How do I check the status of my PERM case? Why is my PERM taking so long to process? What are the DOL/USCIS fees to process my PERM case? What is the difference between an EB2 and EB3 petition? I have a master’s degree. Do I automatically qualify for EB2? When will my PERM case be filed? I have not received any forms for signature. When will I sign the PERM ETA 9089 forms? How long must the supporting documentation (advertisements, resumes of applicants, etc.) be retained? Why do we have to post advertisements and other steps for the position? Is there a list of newspapers that are acceptable in which to place the advertisements for PERM? The ads are expensive in the big papers and I don’t want to spend a lot. Do we need to list the offered wage in the newspaper and other recruitment steps? What recruitment steps must take place? How much detail do I need to include in the recruitment report? How long does it take to receive the prevailing wage determination? Can I change employers during my PERM process? Does every applicant that submit his/her resume need to be interviewed by the employer? How does the PERM ETA account work? Why can’t the attorney’s office do this for me? My case has been audited. Should I be concerned? Why can’t I use the experience I have with my current employer to count towards the minimum requirements for the PERM position? My case was filed under EB3. Can I convert it to EB2? Can I pay for my PERM process? What if my employer pays and I reimburse them? Is my case being filed under RIR, TR, or PERM processing? How long is my PERM case valid for? What documents do you need from me in order to file my case? What constitutes a valid experience letter? Will my service certificate do? What about affidavits? Can you give me examples of good and bad experience letters? I want some "official" information on PERM. Where can I go? I have a question that has not been answered here. What should I do? “A permanent labor certification issued by the Department of Labor (DOL) allows an employer to hire a foreign worker to work permanently in the United States. In most instances, before the U.S. employer can submit an immigration petition to the Department of Homeland Security's U.S. Citizenship and Immigration Services (USCIS), the employer must obtain an approved labor certification request from the DOL's Employment and Training Administration (ETA). The DOL must certify to the USCIS that there are no qualified U.S. workers able, willing, qualified and available to accept the job at the prevailing wage for that occupation in the area of intended employment and that employment of the foreign worker will not adversely affect the wages and working conditions of similarly employed U.S. workers. To improve the operations of the permanent labor certification program, ETA published a final regulation on December 27, 2004, which required the implementation of a new re-engineered permanent labor certification program by March 28, 2005. This new electronic program has improved services to our various stakeholders. 2. What qualifications are there for a PERM Labor Certifications? “Applications filed on or after March 28, 2005, must file using the new PERM process and adhere to the new PERM Regulations. The job opportunity must be for a full time, permanent position. There must be a bona fide job opening available to U.S. workers. 3. How do I check the status of my PERM case? Presently, there is no way for an employee to check his/her status on an online system. The only way to obtain the status of a PERM case is to have a sub-account on the PERM ETA system that is setup by the employer. Once the PERM petition has been certified, the PERM ETA system automatically sends an email to the employer notifying him/her of the approval. Our office also checks the statuses of pending cases on a regular basis. Once we note the PERM case has been approved, we email the employer to confirm it is OK to move forward with the I-140 process. With the employer’s approval, we send out the I-140 questionnaire and notify the employee of certification. 4. Why is my PERM taking so long to process? PERM processing times have been extended for the reason that the originally established PERM centers in Atlanta and Chicago have merged into one PERM center (Atlanta.) Hence, Atlanta has had to take on all of Chicago’s case load. There is addition speculation of the current economy and other theories, but no official correspondence from the DOL has explained the delays. The DOL maintains that "FIFO" (First In, First Out) is still its policy. For regular PERM cases, we are noticing an average of 10-13 months. For cases subjected to random or targeted audit, processing times may reach 1-2 years. 5. What are the DOL/USCIS fees to process my PERM case? Currently, there are no filing fees with the DOL to process a PERM labor certification petition. 6. What is the difference between an EB2 and EB3 petition? In general, an EB3 position is based on the minimum requirement of a bachelor’s degree plus experience while an EB2 position is based on the minimum requirement of a master’s degree plus experience. For much more detailed information on these categories, please see below and our EB2, EB3 sections. 7. I have a master’s degree. Do I automatically qualify for EB2? 8. When will my PERM case be filed? The employer must conduct all of the recruitment steps and determine no US worker is available, able, or willing to fill the position. The employer has 180 days from the time the first recruitment step is initiated to file the petition under the recruitment efforts. In general, after the recruitment is completed, the petition may be submitted 30 days after the final recruitment steps is conducted, and all applicants are appropriately contacted. The recruitment must be conducted adhering to the DOL good faith recruitment standards, and neither the beneficiary nor the attorney may be involved in the recruitment process by law. Upon filing the PERM petition, our office will send the employer and employee an email notifying that the PERM petition has been filed. The employer will then need to complete a questionnaire sent to him/her by the Department of Labor in order to confirm the submission of the case to continue processing. 9. I have not received any forms for signature. When will I sign the PERM ETA 9089 forms? The PERM ETA petition is filed electronically on the ETA online system. Signatures do not occur until after the PERM petition has been certified by the Department of Labor. Prior to filing your I-140, our office will send you the original page for your signature of the ETA 9089. In order to file the I-140, the employer, employee, and attorney must all sign the original blue ETA 9089 pages that have been approved by the Department of Labor. 10. How long must the supporting documentation (advertisements, resumes of applicants, etc.) be retained? The employer is required to retain all documents related to the PERM process for a minimum of 5 years from the PERM filing date. The Department of Labor and/or USCIS may audit these documents at anytime during the 5-year period. 11. Why do we have to post advertisements and other steps for the position? In order to file a PERM Labor Certification, the employer must conduct recruitment as mandated by the Department of Labor in order to determine if any available, able, or willing US workers qualify for the job. In order to provide the opportunity for US workers to apply for the position, the employer must conduct “good faith" recruitment as outlined by the Department of Labor. If no willing, able, or available US workers qualify for the position, then the employer may file the PERM Labor Certification petition. This process is required in order to protect US workers. For more information on recruitment, please see below. 12. Is there a list of newspapers that are acceptable in which to place the advertisements for PERM? The ads are expensive in the big papers and I don’t want to spend a lot. At this time, there is no official list of newspapers that are acceptable by the DOL. The employer should know which papers are of the largest circulation closest to his location. Though it may be more cost-effective to post the position in a smaller paper, this is definitely not advisable. In order to demonstrate the good-faith recruitment effort to the Department of Labor, the position should be posted in a local, mass-circulation newspaper. 13. Do we need to list the offered wage in the newspaper and other recruitment steps? No. The only places the salary must be listed are on the job bank and on the Notice of Job Opening (Position Opening Notice.) You do not need to list the salary on your company website, other additional recruitment efforts, or advertisements. 14. What recruitment steps must take place? At the end of the recruitment process, the employer must provide a letter detailing the recruitment efforts placed and the result of the recruitment efforts. For more specific PERM details, please visit our PERM Labor Certification page. 15. How much detail do I need to include in the recruitment report? The recruitment report should be fairly general. You do not need to list the names of all the applicants or the exact tools/duties/education/etc. that they lack. However, the number of applicants and the general reasons for not qualifying should be listed, such as not possessing the required education, or the person requiring immigration processing. 16. How long does it take to receive the prevailing wage determination? Each SWA (State Workforce Agency) varies on the amount of time it takes to respond to the PWR (Prevailing Wage Request) with the PWD (Prevailing Wage Determination.) Some SWA’s respond within a few business days, while some take a few months. 17. Can I change employers during my PERM process? The PERM petition is based on future employment, so you do not need to work for the company filing the PERM labor certification at the time of filing. However, in order to pursue the GC with the designated company, the employer and employee must have the intent that the person will work for the company at the time permanent residency is granted. If you leave your company while your PERM process is pending, it is your employer’s decision as to whether or not to pursue the subsequent processes or to withdraw the PERM labor certification. PERM labor certifications are not portable. The only scenario in which a PERM petition from a previous employer is of relevance is if the PERM and I-140 petitions have been approved for that previous employer, and the employer is willing to NOT withdraw the approved I-140. Then, when joining the new company, the new employer must file a PERM petition and subsequent I-140 petition. At that time, a re-capture of the previously approved I-140’s priority date may be requested. For information regarding switching employers at the I-485 stage, please see the I-485 FAQ’s section. 18. Does every applicant that submit his/her resume need to be interviewed by the employer? Applicants that appear to meet the minimum requirements for the position need to be contacted in order to determine if he/she in fact is qualified. For example, if the position is for a Programmer Analyst requiring a Bachelor’s degree and one year of experience, and the person applying for the position does not have a Bachelor’s degree, or has a Bachelor’s degree in an unrelated field, that person would not need to be contacted. However, if it is unclear by viewing the resume whether the candidate may qualify or not, that person must be contacted to determine if he/she qualifies for the position. Detailed records should be kept of all contact with applicants, such as phone logs and the reasons the person didn’t qualify, if applicable. 19. How does the PERM ETA account work? Why can’t the attorney’s office do this for me? The Department of Labor monitors the IP address from where the account is setup. For this reason, and for quality control purposes, the main employer account must be setup by the employer only. The employer can register at http://www.plc.doleta.gov by clicking on the “Register" button and following the subsequent steps. After registration, the Department of Labor will either issue the username, password, and pin within a few days, or they will audit the existence of the employer. The employer should be on the look-out for an email from the Department of Labor after registration. If audited, the Department of Labor will ask for various documentation to prove the employer is a bona fide business entity, such as tax documentation, utility bills, lease agreements, FEIN documentation, etc. The employer should respond to this email as quickly as possible. Once the Department of Labor has evaluated the documentation, they will issue the user ID and password to the employer. After the username and password are issued, the employer must then create a sub-account for the attorney’s use. To do this, the employer must login to the PERM ETA account and click on the “User Accounts" tab, and then on “Activate User Accounts." Then, the employer must setup the sub-account for the attorney’s use in order for the attorney to file petitions on the company’s behalf. Once the account has been setup, the Department of Labor will send an email to the attorney’s office with his/her username and password for future use. For questions about setting up the PERM account, please email us or visit the Department of Labor’s User Guide by clicking here. 20. My case has been audited. Should I be concerned? In order to continue to confirm the PERM process as a valid and bona fide program, the Department of Labor may issue a random or targeted audit on any PERM case. There is a set period of time within which the audit must be responded to. When any item is required from the employer or employee’s side, we will contact the concerned party accordingly to respond to the audit appropriately. It is worthwhile to note however that an audit, whether random or targeted, means a delay in processing. The Department of Labor is backlogged with audit cases which are taking more than a year to process at this time. 21. Why can’t I use the experience I have with my current employer to count towards the minimum requirements for the PERM position? In order to use experience gained with the current employer, evidence must be provided that the previous position was at least 50% different than the position for which the PERM case is being filed. Otherwise, experience gained with the current employer in the position is not acceptable towards qualifying experience for the reason that it provides an unfair advantage against US workers applying for the position. 22. My case was filed under EB3. Can I convert it to EB2? There is no way to “convert" a case from EB3 to EB2 because the recruitment efforts are conducted based on a specific position with its EB3 or EB2 requirements. The only way to pursue a method of taking the EB3 priority date with pursuing the EB2 petition is as follows. 1. The EB3 PERM is approved, and the I-140 is filed with the EB3 petition and subsequently approved. 2. A new EB2 PERM is filed and subsequently approved. 3. A new I-140 petition using the EB2 PERM is filed, including a copy of the EB3 I-140 approval notice, requesting the EB3 priority date “re-capture." Once the petition is approved, the EB3 priority date will be retained with the EB2 category petition. 23. Can I pay for my PERM process? What if my employer pays and I reimburse them? The beneficiary (the person on behalf of whom the PERM Labor Certification is being filed) is NOT permitted BY LAW to pay for any part of the PERM fees including advertisement costs, attorney fees, etc. The employer is required to pay for all PERM costs; however, the beneficiary is permitted to still pay for I-140 and I-485 processing. And no, you cannot reimburse your employer for PERM processing fees either. The law stating that the employer must pay for PERM costs was implemented on July 15, 2007, by the Department of Labor. 24. Is my case being filed under RIR, TR, or PERM processing? RIR (Reduction in Recruitment) and TR (Traditional Recruitment) labor certification cases were discontinued in March 2005. The Backlog Elimination Center was created to complete the processing of these types of ETA 750 Labor Certifications. The only current way to process a Labor Certification is by filing a PERM Labor Certification using Form ETA 9089. 25. How long is my PERM case valid for? PERM petitions are valid for filing I-140 petitions for 180 days. 26. What documents do you need from me in order to file my case? Copy of complete passport including all visa pages, visa stamps, entry/exit stamps, etc. If you have a current and expired passport, you should send copies of both. 27. What constitutes a valid experience letter? Will my service certificate do? What about affidavits? [ ]	The letter must be issued by a supervisor or someone higher-up in the company than you, or HR personnel. The person’s name, title, and signature must be provided. [ ]	If you received any promotions at the company, this should be reflected in the letter, but only if the data does not contradict your H1 title (i.e., internal promotions for which new petitions are not filed are irrelevant.) 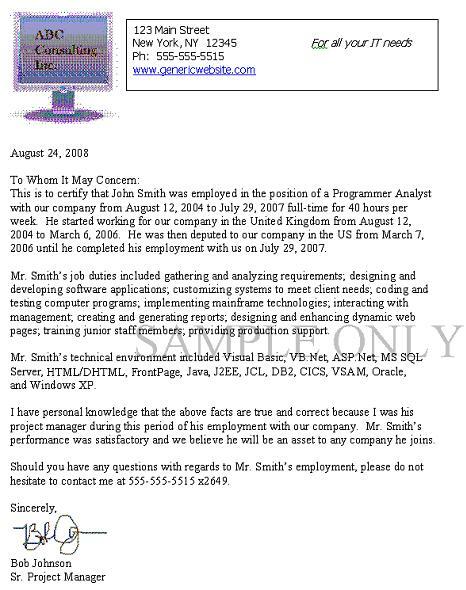 For example: Mr. Smith worked at Company ABC in London, England on a full-time basis (40 hours per week) from April 1, 1997 until February 15, 1999. He was initially hired as a Systems Analyst Intern. In this position, his duties included the following: [insert job duties, including tools, O/S, languages, etc.]. On April 1, 1998, he was promoted to the position of Systems Analyst. As a Systems Analyst, his duties included: [again, insert job duties, including skills used]. [ ]	If your past employer has merged with or has been acquired by another company, the letter should be issued on the surviving company’s letterhead. The letter should include a simple but clear explanation of the merger. For example: Company ABC was fully acquired with Company XYZ on March 10, 1999. We have all employment records for Company ABC and Company XYZ. 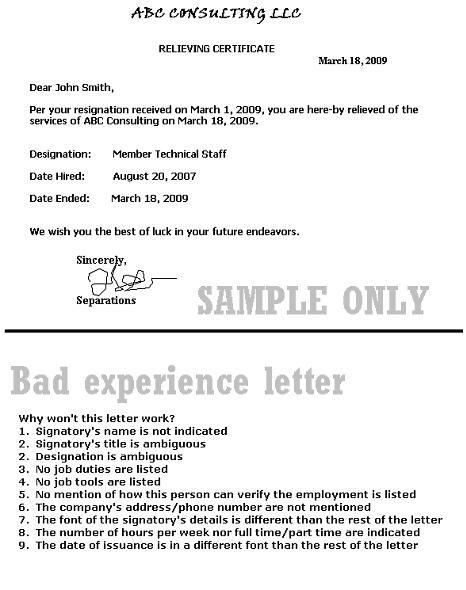 If you do not have experience letters in this format, you must contact your previous employers to obtain them. Please note we do not require an experience letter in this format for every previous employer for whom you have worked. However, since the EB (Employment-Based) Green Card process is based on evidencing your experience, we will need to document a minimum amount of experience in the required format in order to prove to the USCIS/DOL why you qualify. Affidavits are strongly discouraged and should not be used unless there is no other way of obtaining a valid experience letters. You must be advised however, that the USCIS will likely audit the case and ask for a valid experience letter at the I-140 level. If you proceed with an audit, your case will likely be denied, and for this reason, we strongly discourage using them. 28. Can you give me examples of good and bad experience letters? 29. I want some "official" information on PERM. Where can I go? You can find information about the PERM process at the Foreign Labor Certification website. FAQ’s - Round 1, posted 3-3-2005. FAQ’s - Round 2, posted 4-6-2005. FAQ’s - Round 3, posted 5-4-2005. FAQ’s - Round 4, posted 6-1-2005. FAQ’s - Round 5, posted 8-8-2005. FAQ’s - Round 6, posted 2-14-2006. FAQ’s - Round 7, posted 2-21-2006. FAQ’s - Round 8, posted 3-20-2006. FAQ’s - Round 9, posted 11-29-2006. FAQ’s - Round 10, posted 5-9-2007. Information regarding PERM Fraud Rules can be found here, posted May 17, 2007. Updated FAQ’s on the fraud rule may be found here, posted 7-13-2007. 30. I have a question that has not been answered here. What should I do? Our office will be happy to respond to your questions/concerns. Please give us a call at 248-865-3331, or submit the form on the right menu for more information. Or, you can email our head attorney, Joseph Kallabat here.